Egg: Laid on the host or in the bedding and nesting material of the host. Eggs are 0.5mm and pearly white. Usually hatch within 2-3 days. Larvae: Legless larvae, whitish up to 5mm long, occupy humid places in the bedding of the host feeding off the frass and faecal pellets of the adult fleas. Pupae: Produce a cacoon. The adult flea will emerge when the cacoon is disturbed by the vibrations of the host. Adult: The adult flea is about 2mms long and will live on average for two weeks to a year dependant on available food and ambient temperatures. A small laterally compressed wingless insect, yellow to black in colour with backward facing spines. They are an ectoparasite of mammals and birds and feed on the blood of the host when adult. Crawling or leaping away to a new host if/when the host dies. The adult flea will live on the host or will be found alongside the larvae which will occupy cracks and crevices as well as the carpet of houses and bedding of the host animal, feeding on the faecal matter of the adult fleas. 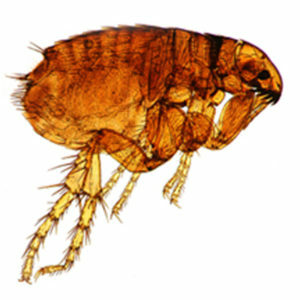 The human flea P.irritans is also a known pest of the red fox, the hedgehog and the badger. The signs of an adult infestation will be most readily recognised by the presence of bite marks on the host, most commonly found around the ankles and areas of the body which come into close proximity to the adult harbourage. Stingray, Cimetrol, Nylar 4 EW, Cytrol Forte. 1. The British Pest Management Manual. Section 5, pg 143. 2. ‘Pest Animals in Buildings, a world review’. Norman Hickin pg 175.